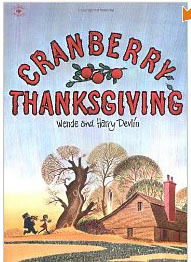 I can’t help but think of some of my favorite books from childhood, Cranberry Thanksgiving, Cranberry Christmas, and even Cranberry Halloween written and illustrated by Harry Devlin. I remember walking to the library with my Grandma, who was a 3rd grade teacher, and checking out as many books as my tote or hers could carry. The Cranberry books were especially great because at the end of the story there was a recipe, with cranberries. Yum! My favorite recipe was in the Halloween book and was some sort of a ‘pie’. It involves a lot of butter, sugar and flour. So, I don’t think I’ll be making it anytime soon. 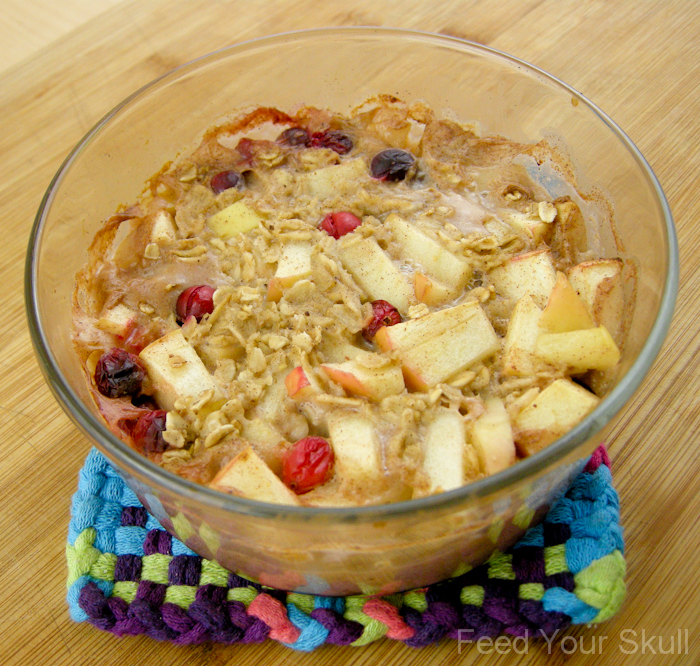 This oatmeal, though, is really tasty with the sweet apples and fresh tart cranberries. It also will make your house smell amazing! Enjoy! Preheat oven to 380 degrees Fahrenheit. Grease a 4 cup pyrex bowl with coconut oil. First add in oats, cinnamon, and nutmeg. Stir it up. Next add the apple, cranberries, vanilla, maple syrup, and almond milk - mix well. We’re on day 4, of tasty baked oatmeal recipes. Have you made one yet? What is your typical breakfast? Green smoothies. Love them! Michelle….you may be taking oatmeal to a whole new level for me. My typical breakfast is having oatmeal 98% of my mornings. I usually microwave 1/2 cup old-fashioned oats w/1 cup of water. Zap for 1:30 minutes. Stir. Zap for 20 seconds. Retrieve from microwave. Then add a 1/4 cup scoop of dried cranberries and add 1/2 cup of walnut halves that I break into smaller pieces. Because the dried cranberries are sweet, I do not add syrup or brown sugar (which I used to do). Stir in about 1/2 cup 1% milk and I’m on my way. BUT…I will definitely give your recipe a try. COSTCO had large bags of cranberries yesterday, which I did not buy. I believe it is time to stock up while the season is here and freeze several bags. The irony about oatmeal is that my great-grandfather Lachlan and his siblings survived on it during periods of near starvation in the Scottish Highlands. I’ve heard that it was considered the poor man’s fare in Scotland. However, my family went on to serve as a staple when I grew up on the farm. Before school each morning, my Dad would mix up a big pot of oatmeal or fried eggs for the five of us kids. When we visited Scotland in 2010, I was delighted to savor porridge as part of my traditional Scottish breakfasts there. Thanks for allowing me a trip down memory lane! Now it is time to have some breakfast!